Interior Alaska is a land of extremes. The sub-arctic climate has but two seasons according to popular descriptions: summer and the rest of the year. From October through mid-April, the reign of winter is absolute. The arrival of summer in late April/early May is announced by the thundering sounds of breaking ice on the larger rivers. After months of silence, the event seems as sudden as it is spectacular. First, the smaller streams and rivers thaw sending currents of water out over the river ice or swelling the flow from underneath. 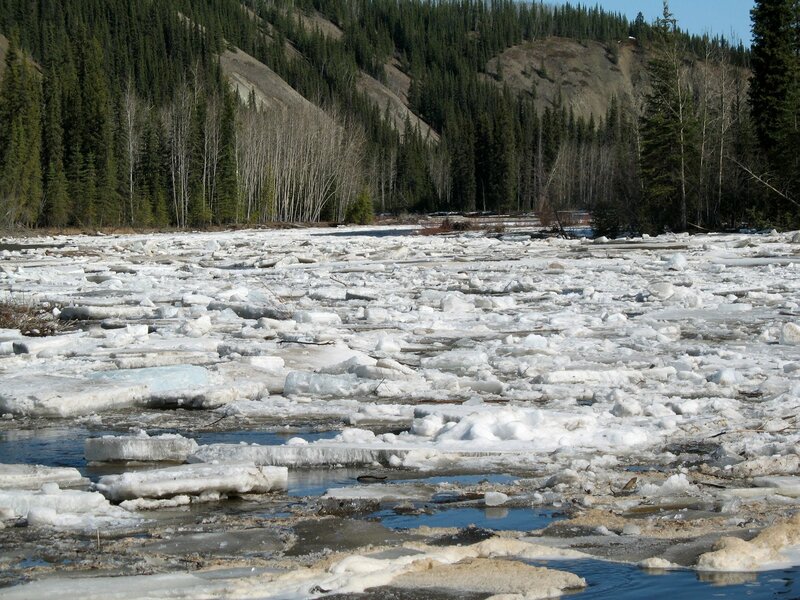 As the flow increases, the river ice is lifted and begins to move. Motion causes the frozen masses to splinter and shatter, releasing ice floes which tumble down the valleys shoving away everything in their path. As the ice slabs rush downstream knocking each other to bits, they often lodge together forming temporary dams backing up acres of water. Pressure builds until the dam collapses and the new torrent hurtles ice and uprooted trees over the river's banks. Watching the mountains of ice alternately building and falling, one is filled with a sense of awe and gratitude for the return of life and light to this northern land. Soon enough, the air will heat up to nearly 100 in nearly round-the-clock sunlight, but now, for a few brief spring weeks, the battle will rage between winter's fading grip and summer's coming triumph with snow squalls, hail storms, warm, sun-soothing mornings, icy cold-windy afternoons, brief cold rain shower and hot dry dust devils. The quality of your articles and listing is really attractive. The countertop traditional instance, suggested by Erwin Schrodinger like a put-down towards the Copenhagen Meaning, showing it all’s absurdity, was the kitten of Schrodinger. The gist of the thought test (no pet was actually really concerned, therefore pet enthusiasts may breathe-easy) was that there could be some kind of quantum event (just like a radioactive decay occasion) that had a 50-50 possibility of occurring in one single hr. When the occasion occurred, it’d trigger a series of occasions that will trigger the brave frontier of the kitten caught in a opaque covered container off. The kitten could be living within the covered container when the quantum occasion did not occur. The query is, after one-hour, may be the kitten dead or living?Brave Frontier will improve your performance in the game and will quickly reach a higher level.